amber cooks: fresh strawberry lime margaritas + a bonus recipe! 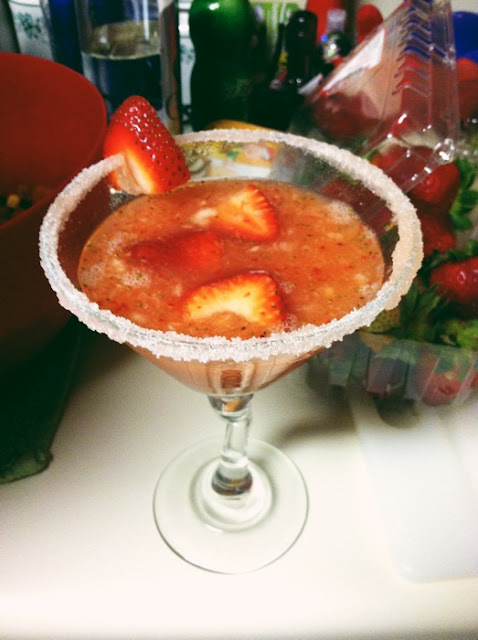 fresh strawberry lime margaritas + a bonus recipe! 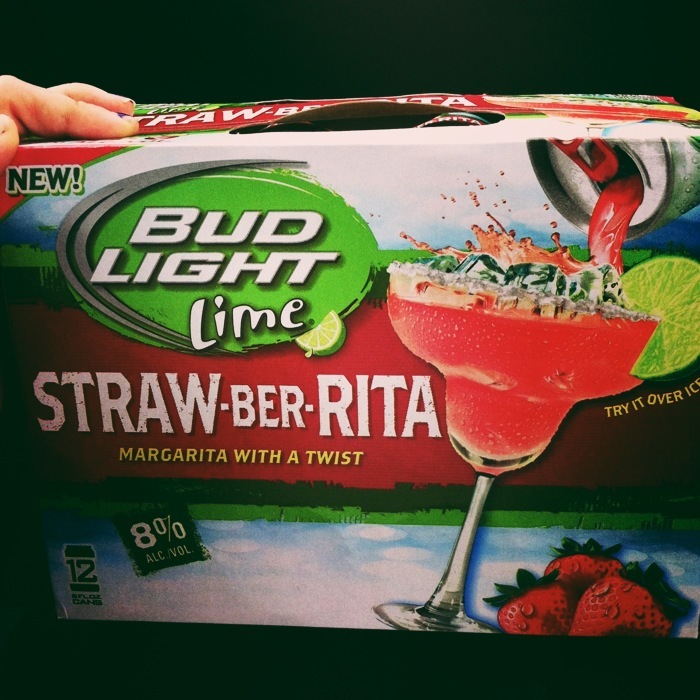 Last weekend was what I like to call "The Weekend of the Strawberry." I'm calling it that and not "The Weekend of the Strawberry Margarita" because, in my defense, I have been making a ton of salads with strawberries too. You know, to balance out the copious amount of margs. Remember back when I said I was going to try these? Well, I finally got around to it. And now I wish I did it sooner because oh my gosh. Bring 1/2 cup sugar and 1/2 cup water to a boil, stirring until sugar dissolves. Combine 1-1.5 cups sliced strawberries with simple syrup in a blender, and blend until combined. Combine tequila, triple sec, strawberry simple syrup, and lime juice in blender and pulse three or four times to combine. *Optional: For frozen margaritas, add 1-2 cups of ice and blend until it's the consistency you like. Run a lime wedge along the rim of your glass and dip in salt, sugar, or salt/sugar mixture. 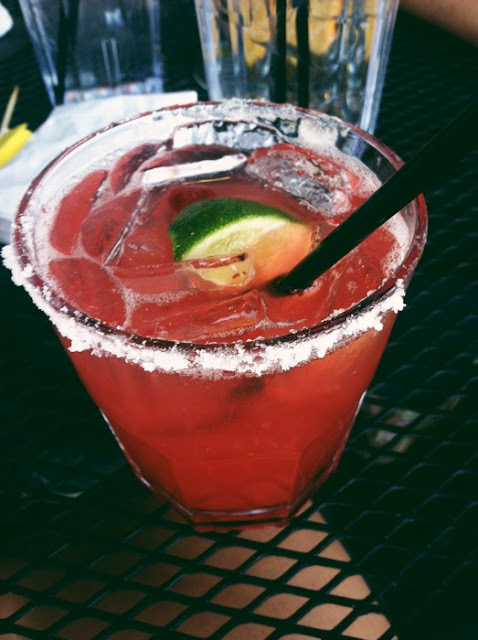 I didn't have actual limes so I wet the rim with margarita, which turned my sugar a nice shade of pink. 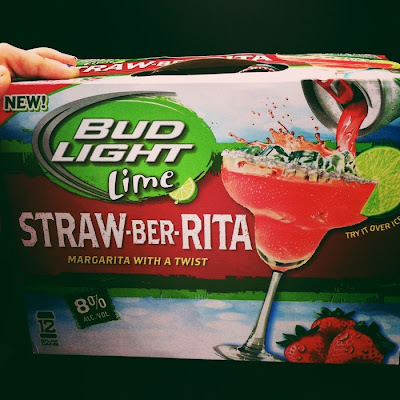 Add a couple sliced strawberries and a lime wedge for garnish, and enjoy! This was the perfect addition to girls' night in Athens last weekend. I mean is there really anything better than homemade cocktails and vampire movie night? Hope you're all having a great week so far! We're almost to the weekend already, can you believe it?! Oh, and if you're wishing I shared something non-boozy today, then you're in luck. 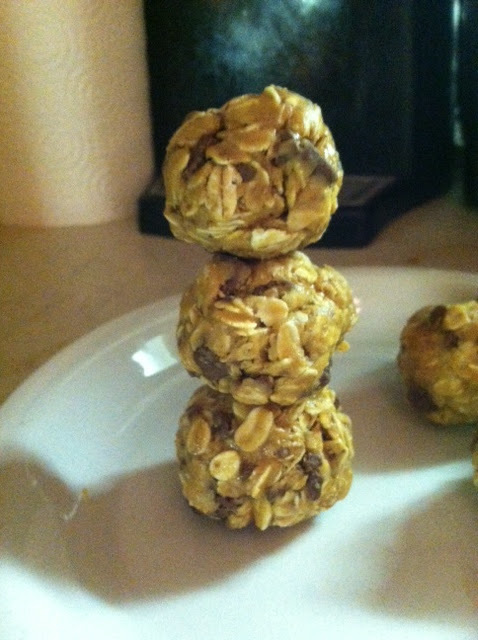 I'm over at Fitness & Feta today sharing a recipe for my No-Bake Dessert Balls! If you have a sweet tooth but want to be calorie conscious, these little buddies are for you. Aspiring home cook, obsessed mom of 2, and lover of all things UGA. Welcome! I hope you find something delicious while you're here! catching up + a very simple stirfry! 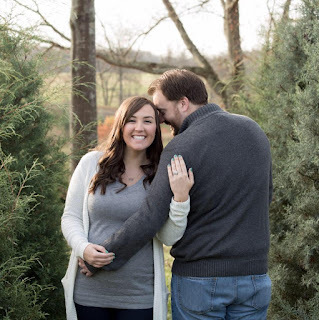 Aspiring home cook, mom of 2, and lover of all things UGA.